Rumors that the PokerStars brand no longer resonates with US players have been grossly exaggerated, at least for now. The operator recently wrapped up the second annual NJCOOP, a two-week long $1.2 million guaranteed tournament series that performed roughly on par with last year’s wildly successful inaugural event. It wasn’t all peaches and cream, but there were enough positive takeaways to virtually ensure PokerStars won’t be reducing the series guarantee next time around. The 2017 iteration of the NJCOOP created a slightly larger prize pool than last year’s event. In total, the prize pool came up just shy of $1.45 million, exceeding last year’s mark by roughly $40k. However, it is worth noting that there were 46 guaranteed events this year, versus 43 in 2016, meaning that the average event prize pool was slightly smaller. There were also more overlays this time around — seven, compared to five last year. And only the same number of events (nine) beat out their guarantees by 50% or more. As was the case last year, the $200,000 two-day Main Event came up just short of its guarantee. Six more entries would have done the trick. As is, the $197,200 worth of buy-ins was nothing to scoff at. 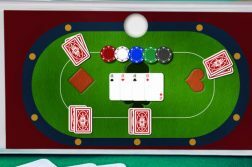 PokerStars ran two augmented editions of its Sunday Special. 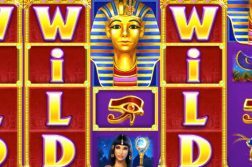 The first generated a hefty $86,909 prize pool and the second a $104,304 pot. Last year’s specials did better, but not by a significant margin. Just one mixed game event did not meet its guarantee, and that was NJCOOP-28 Pot Limit Omaha High Roller. There was a total of nine mixed game events on the slate. Speaking of high rollers, NJCOOP-30 No Limit Hold’em High Roller didn’t fare so hot either. While it came just one buy-in short of meeting its $80,000 guarantee, last year’s iteration managed to produce a $109,250 prize pool. By far the worst performing event was NJCOOP-11, a Heads-Up event that attracted just 58 entrants, producing a more than 20% overlay. Last year, not a single overlay exceeded 5%. Given these statistics, there’s little denying that the second running of the NJCOOP was a slight step backwards. 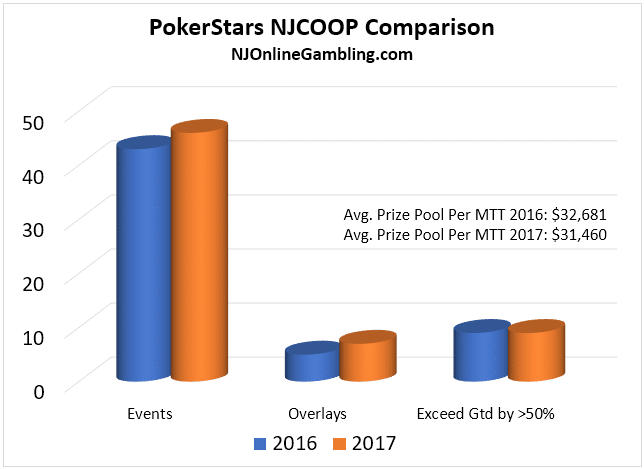 However, it’s important to examine the overall context, particularly that last year’s NJCOOP was by far the most successful tournament series run by a NJ online poker operator. Not only that, but online poker wasn’t in as strong a position heading into this year’s event as it was in October 2016. 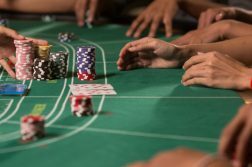 According to traffic tracking site PokerScout.com, PokerStars hasn’t averaged more than 100 cash game players in a while, with current averages at just 85. Overall industry liquidity is markedly down as well. PokerStars has passed the baton to the Borgata online poker network, with the latter currently hosting the seventh running of its Garden State Super Series (GSSS). Thus far, the modest series has been a mixed bag, with the opening event cruising by its $60,000 prize pool ($72,400 worth of buy-ins), and GSSS Fall ’17 #2 – $50,000 GTD High Roller missing the mark. That makes it three high buy-in events in a row that failed to live up to expectations, suggesting that there may not be a huge appetite for high-profile events in the small NJ market. $200 – $300 buy-in events appear to be a significantly more compelling price point. The GSSS Fall ’17 series will conclude this Sunday with a $320 buy-in, $100,000 guaranteed Main Event. Together with the NJCOOP, we should see overall NJ online poker revenue for October spike to its highest point of 2017.